He was the only horse to beat Breeders' Cup Classic winner Accelerate in 2018, and Mr. and Mrs. William Warren's City of Light did it again at the beginning of 2019. 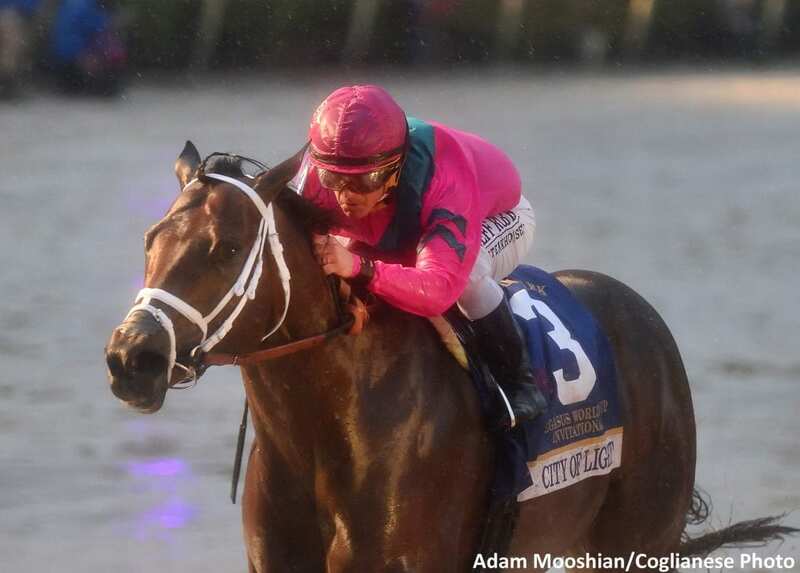 The 5-year-old son of Quality Road seemed to relish the sloppy conditions at Gulfstream Park, settling just off the pacesetter and kicking away in the stretch to win the third running of the $9 million Pegasus World Cup by 5 3/4 lengths. Ridden by Hall of Fame jockey Javier Castellano as the second choice at 9-5, City of Light covered nine furlongs over the sealed main track in 1:47.71. The Michael McCarthy trainee won the Breeders' Cup Dirt Mile at Churchill Downs in November, and will now be sent off to Lane's End to begin his stallion career. Dallas Stewart trainee Seeking the Soul got up late at 34-1 to fill out the exacta, while 7-5 favorite Accelerate (also retiring to Lane's End) had to settle for third. Once again, 10-1 chance Bravazo finished well to earn fourth money, and Audible completed the Super Hi-5 at 9-1. City of Light broke sharply near the inside, but Jose Ortiz aboard Patternrecognition gunned his mount from the outermost post position and took the lead heading into the clubhouse turn. Castellano held City of Light just off that leader through fractions of :23.23 and :46.84, with Bravazo, Accelerate and Tom's d'Etat not far behind. Castellano let City of Light challenge Patternrecognition at the turn, and found himself alone on the lead at the five-sixteenths pole. Accelerate was in pursuit, but jockey Joel Rosario had a decision to make: whether he would risk the inside path or go around City of Light. Rosario opted to swing wide, and Accelerate responded a bit over-zealously. It didn't cost him the race, but possibly a length or two as City of Light kicked away to a commanding lead in the lane. City of Light cruised under the wire a dominant 5 3/4-length winner. Seeking the Soul came from well back to earn second over Accelerate, while Bravazo ran gamely as ever to finish fourth. Audible was fifth, and local favorite Gunnevera finished sixth. True Timber, Imperative, Tom's d'Etat, Something Awesome, Kukulkan, and Patternrecognition completed the order of finish. Bred in Kentucky by Ann Marie Farm, City of Light was a $710,000 yearling purchase at the Keeneland September sale. He debuted in the middle of his 3-year-old season, winning at second asking, and jumped into Grade 1 company at the end of 2017 to win the G1 Malibu Stakes. In 2018 he won the G1 Triple Bend, then stretched out to defeat Accelerate in the G2 Oaklawn Handicap. City of Light ran third in the G1 Gold Cup at Santa Anita, then went back to sprinting to finish second in the G1 Forego. He won the Breeders' Cup Dirt Mile in his penultimate start, but proved his routing capability beyond a doubt with his swansong win in the Pegasus World Cup. City of Light retires with a record of six wins, four seconds and a third from 11 starts, with earnings of over $5.6 million. Joel Rosario (Accelerate, 3rd): “He was traveling really well. He's the kind of horse you have to keep riding and…the winner, he had a lot of horse today. It looked like it was easy for the winner. This entry was posted in NL Article, Pegasus World Cup and tagged accelerate, audible, bravazo, breeders' cup dirt mile, city of light, Gulfstream, gulfstream park, gunnevera, Javier Castellano, Lane's End, mike mccarthy, Pegasus, pegasus world cup, Quality Road, seeking the soul, William Warren by Paulick Report Staff. Bookmark the permalink.